Newton is one of the busy villages along the road between Sudbury and Colchester. This close to the Essex frontier, the area has something of the feel of border country. gentle hills, the last gasp of the eastern end of the Chiltern range, roll down to die in the Stour valley. It is a pleasing landscape; but, unless you are a golfer and like that sort of thing, the village of Newton is greatly spoilt by the conversion of its green into a golf course. I am not a golfer, and it is hard to see any great beauty in the main road through this village, which is in any case the main road, despite the collection of fine 16th and 17th century houses on the north side. But the setting of the church is lovely, down a lane opposite the golf course. Quite what the people who live in the house on the north side of the churchyard have done to deserve it, I don't know; but it must have been something really good, because it is one of the sweetest houses I've seen around here. By the 1960s, this church was in a terrible state; the roof of the nave was in desperate need of repair, and the congregation had retreated into the chancel. 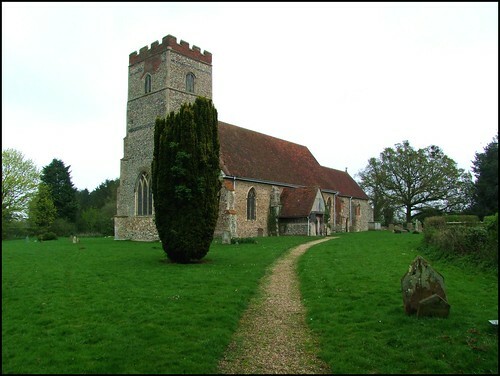 In a great act of pragmatism, the nave and tower were declared redundant, and vested in the care of the Redundant Churches Fund, now the Churches Conservation Trust, who carry out their duties here with customary enthusiasm. The exterior is somewhat stark at a distance, but closer to there are lovely little headstops surviving on the windows, and the 14th century wooden porch is a delight, one of the largest of its kind. On the north side, so you'll need to go round, is a good Norman doorway. The CCT tries to keep the church open all the time, and you step down into a spacious interior. The font has been moved back into the nave, opposite the entrance. Behind it is the now-filled-in north doorway, with a pretty modern patterned window set in it. During the restoration of the nave walls, remarkable 13th Century wallpaintings were found, which have been carefully restored. They show a sequence of three moments in the story of the Incarnation as described in St Luke's Gospel. From the left, the angel appears to Mary at the Annunciation, who appears uncharacteristically confident as she faces him. Another angel has his back to her, and Mortlock suggests he may be attending the subsequent Visitation scene. However, this doesn't seem quite right, and there is quite a large blank at this point in the sequence, where something has been filled in. At first I wondered if it is actually the appearance of the angel to Joseph, as mentioned in St Matthew's Gospel. However, if you look more closely you will see that the angel is holding a censer. Now, this would suggest that there was, in fact, an image niche in the missing part, and possibly a second censing angel facing the other way beyond. Leter, they appear to have been destroyed for a window. After the Visitation, there is a faint but exquisite Nativity. The sequence forms the first three joyful mysteries of the rosary, although of course the sequence was rather less concrete at the time this was painted in the 13th century. It is one of the best sequences I know, rather different in scale and style to the same sequence at nearby Wissington. The paintings are so remarkable that you might not notice something equally remarkable in front of them. This is a pre-Reformation pulpit, in a wineglass style. Several of these survive in Suffolk; what makes this one so special is that it retains its dedicatory inscription, Orate P(ro) A(n)i(m)a Richi Mody et Leticie (Consortis suae) (Pray for the soul of Richard Mody and Letitia his wife). In the south wall, opposite the pulpit, is a low tomb recess, with the effigy of a woman in it. The effigy was found under the floorboards during the 1870s restoration; Mortlock thinks it is in its right place, which is probably so, although it does seem a little unusual. A nice piece of Victorian sentiment is fixed to the back of it, possibly from the panelling of the pulpit before it was properly restored. In any case, the most significant memorial here is up in the parish church. You step through glass doors into a most pleasant interior, noticing the good set of sedilia and double piscina in the south side of the sanctuary before your eye is caught by the tomb to Margaret Boteler, who died in 1410. The shields are all recoloured of course, but the most remarkable thing is the detailing on her dress. Another lovely detail in the chancel is the scattering of medieval glass in the upper lights of the east window, and in the windows on the south side. One seems to show a rather earnest monk, and another heraldic piece depicts a medieval bee hive. I came back here on a beautiful day in the late spring of 2009. Leafing through the visitors book, I noticed that my last visit had been on Boxing Day 2000. I remembered arriving here with the temperature plummeting, and snow just a few hours away. But this chancel had been a warm, inviting place, a little refuge. Stepping back into the nave that day, the coldness had hit me, probably a consequence of the Minton tiles that the Victorians covered the floor with. I had forgotten that when I'd signed the visitors book that winter day, it had been a new one; it had just one previous entry. This was from the occasion of a Deanery synod a few weeks previously, and featured a dozen or so names of prominent clergy, as well as that of Roy Tricker, then field officer for the Churches Conservation Trust, himself. Not Bishops, or Simon Jenkins; but I'd still felt slightly overawed as I'd signed my name below them.